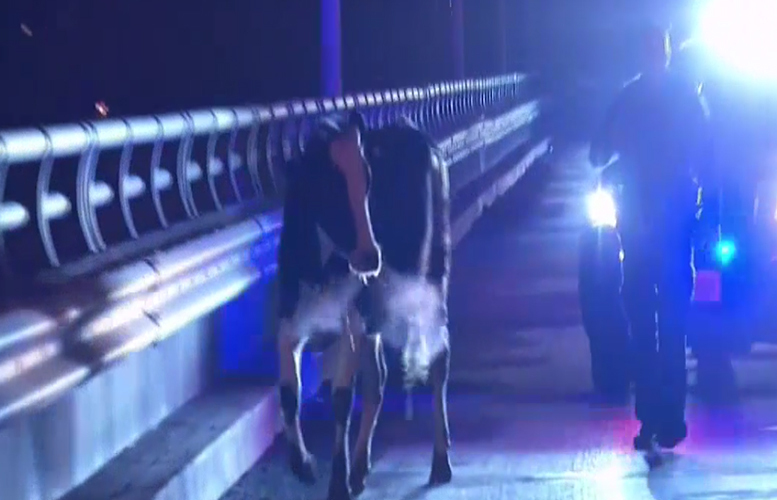 A cow on a post-midnight stroll on Route 80 in Paterson was rescued early Thursday morning. Motorists reported seeing the cow at the downtown Paterson exit (Exit 57) on Route 80 East at around 2:40 a.m. One person called police and said an injured cow was in middle of the highway. It took first responders more than an hour to corral the cow with tow trucks and police vehicles. The Skylands Animal Sanctuary and Rescue of Wantage has taken the cow to a vet for treatment. It stated the cow jumped out of the second floor of a transport truck onto the highway.